Weightlessness sure looks like a lot of fun, but prolonged exposure to zero-G in space can have some negative side effects -- like the weakening of human bones! October 1, 2001: Everybody knows space is dangerous. Some of the perils are obvious: hard vacuum, extreme cold, and unpredictable blasts of radiation from the Sun. Other perils are less conspicuous. The effects of prolonged weightlessness on the human body, for example, can be slow and subtle -- yet no less dangerous if astronauts fail to take proper precautions. Right: The loss of bone mass that many people experience in space could eventually weaken the bone and so present problems when the person returns to a weight-bearing environment, such as the Earth or Mars. Image courtesy NASA's Johnson Space Center. Weakening of the bones due to the progressive loss of bone mass is a potentially serious side-effect of extended spaceflight. Studies of cosmonauts and astronauts who spent many months on space station Mir revealed that space travelers can lose (on average) 1 to 2 percent of bone mass each month. "The magnitude of this [effect] has led NASA to consider bone loss an inherent risk of extended space flights," says Dr. Jay Shapiro, team leader for bone studies at the National Space Biomedical Research Institute. Space travelers aren't the only ones who worry about bone loss. At least 10 million people suffer from bone loss in the U.S. and untold numbers worldwide -- it's called osteoporosis. Postmenopausal women are especially prone to osteoporosis, but they're not alone. Most of us contract the disease as we age, including men. Researchers hope that solving the riddle of bone loss in space will reveal important clues about what causes osteoporosis (and other bone disorders) right here on Earth. Spacefarers typically experience bone loss in the lower halves of their bodies, particularly in the lumbar vertebrae and the leg bones. Diminishing bone mass also triggers a rise in calcium levels in the blood, which increases the risk of kidney stones. Researchers suspect the root cause of bone loss in space is weightlessness. The pull of gravity 350 km above our planet's surface -- where the space station and the shuttle orbit -- is 90 percent as strong as it is on the ground. That hardly sounds weightless! But orbiting astronauts nevertheless feel weightless because they and their spacecraft are freely falling together toward the planet below. Just as gravity seems briefly suspended in a downward-accelerating elevator, so does the crew in the freely-falling space station experience "zero-G." In fact, it's not exactly zero -- but near enough. The acceleration they feel is as little as 0.001% of the gravitational acceleration on Earth's surface. Above: Living in space might appear to be nothing but fun, but some of the effects of weightlessness on the body can spoil the party. Astronauts feel some of them -- such as back pains and vertigo -- while others like bone loss would go undetected without medical equipment. 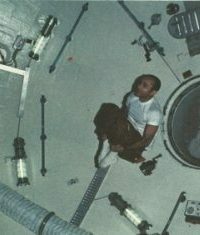 This image was taken in NASA's Skylab. Image courtesy NASA JSC. This reshaping is performed by two types of bone cell that are constantly building new bone or destroying old bone. The actions of these two cell types -- called "osteoblasts" and "osteoclasts" -- usually balance each other out. But when stresses on bones are reduced (or during the onset of osteoporosis), removal outpaces replacement, leading to too little bone which can more easily break. In prolonged weightlessness, bone mass appears to decrease because the lack of stress on the bones slows the formation of osteoblast cells. Fewer bone-building cells, along with a constant level of bone-destroying activity, translates into a net loss of bone mass. Why weightlessness should inhibit the development of osteoblasts is the subject of a current study at Vanderbilt University. A key chemical in the development of osteoblast cells from precursor cells is an enzyme called "creatine kinase-B." Investigators are trying to figure out which molecules in the body regulate the activity of this enzyme and how those chemicals are affected by low gravity, in the hope that this knowledge will point to a way to boost osteoblast formation in space. Another study at the Medical College of Georgia is investigating a possible connection between eating and bone destruction. Ingestion of food causes levels of a certain hormone -- called "glucose-dependent insulinotropic peptide" -- to increase in the bloodstream. The main function of this hormone is to stimulate the production of insulin after a meal, which in turn triggers cells to absorb energy-providing glucose from the blood. Bone cells are sensitive to this hormone, too. Researchers have found that when this hormone attaches to "receptor" molecules on bone cells, osteoclast (bone destroying) activity goes down and osteoblast (bone creating) activity goes up. Could hormones like this one be given to space travelers as a supplement to prevent bone degradation? Scientists don't yet know. Genetic make-up might also play a role, as suggested by the variation of bone loss observed between individual astronauts and cosmonauts. "The 1 to 2 percent per month loss is an estimate of bone loss -- an average value," Shapiro says. "Certain individuals on six month flights have lost as much as 20 percent of bone mass throughout their lower extremities." 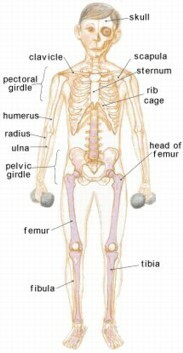 Others were less affected, losing bone only in some areas of the lower extremities. "Bone loss of this magnitude leads to a significant increase in fracture risk, which may be as much as five-fold that expected with normal bone mass on Earth," he added. "A limb fracture involving, say, one of a six-person space crew could seriously compromise a mission's objectives." Indeed, adds Shapiro, "the problem of bone loss must be overcome before people are placed in the position of performing physically challenging tasks after a long space-voyage in zero-G."
Bone loss is hardly such a far-off concern, though. Right here on our own planet millions suffer from osteoporosis -- a malady that strikes ordinary people and far-out explorers alike. Solving the problem in space, say researchers, will likely bring welcome relief back home to Earth. Editor's Note: In the story, above, the authors mention that the crew of the ISS and the ISS itself are freely falling together toward Earth. The space station doesn't come crashing to the ground because it's going forward so fast, about 28,000 km/h, that its fall matches the curvature of the Earth. It literally "falls around" the planet. NASA's Office of Physical and Biological Research -- tackling puzzles like osteoporosis through space research. Gravity Hurts (So Good) --Science@NASA article: Strange things can happen to the human body when people venture into space -- and the familiar pull of gravity vanishes. National Space Biomedical Research Institute -- home page. Bone Loss research group -- webpage for the division of the National Space Biomedical Research Institute studying bone loss in space. Also has links to other divisions of NSBRI that deal with different medical issues related to space travel. Prevention of Bone Loss During Manned Space Flight -- information about the Vanderbilt University research discussed in this article. Sub-regional Assessment of Bone Loss -- fact sheet for an experiment on bone loss conducted on the International Space Station during Expedition Two. Information on this experiment from NASA's Johnson Space Center can also be found here . Medical benefits of NASA research on bone loss -- information on how research to solve the mystery of bone loss in space helps to advance the treatment of osteoporosis. A Boon for Bone Research -- a medical tool for measuring bone stiffness without using radiation was developed for researching bone loss in space, but it is also proving useful for diagnosing bone loss here on the ground. Calcium Kinetics During Spaceflight -- technical information about how calcium is regulated in the body, both on the ground and in space. From NASA's Johnson Space Center. 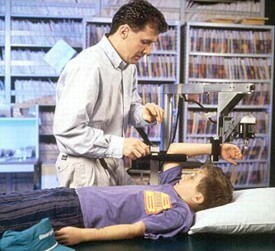 Bone Function -- from the National Space Biomedical Research Institute. Investigation of bone growth in space -- from the National Space Biomedical Research Institute.